I was not satisfied. He was supposed to get data that was to be captured about the temperature of my refrigerator, but his gadget didn't work, so the call resolved nothing. He replaced a wire, but that changed nothing. The temp still rises to 15 degrees and more in my freezer. I will be calling for another service call. Our request was simple - replace the top of dryer that had scratches when we moved in to our townhouse. Initial delivery from manufacturer took some time, which is fine. However, new part was in really bad condition and worse than existing part that we wanted to replace. (Probably not a fault of Twin Cities Appliance). So, we had to send that back and ask for a new replacement part. To our amazement and horror, new part also had same issue. So, we had to send that back as well. I know, I'm repeating myself for third time, new part was also in a bad condition and we had no choice but to send that back as well. As of now, we have waited for over two months without getting good replacement part and don't really know how to express my frustration. Dave did a great job! I had a great experience, would recommend to others. I don't say that about too many other companies. Arrived at the time he stated and he did an excellent job. Very kind and nice gentleman. I appreciated Dave calling to let me know he was on his way. The cost was fair but I just had the same part replaced 9 months prior. Dave was very polite and even called tech support to inquire about a theory I had as to why the part needed replacing again already. Mike T was great! Very knowledgeable and friendly! 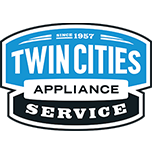 Jared Faber represents Twin Cities Appliance is the most positive way. Professional, friendly, knowledgeable, and does what it takes to do the job right. Great company and great rep. He did a great job - total pro and very nice as well. Couldn’t be happier. TC Appliance did a great job! We had been without an ice maker for two years and finally called to have it fixed. Service was great and affordable. We are happy to have an ice machine again and not have to run to the gas station every time we needed ice. The service and communication was great. Followed up to ensure stove top arrived, checked condition, and responded quickly to install. The installer was professional and friendly. Jared was on time, very polite, and fixed the problem quickly and correctly. Called at 8am, job was finished and working at 2:30 amazing! BACKSPLASH ADMIRAL PARTS "Dropped off 3 refrigerator doors, 1 microwave door and 3 core parts. Picked up some comp,eye forms and trash stickers." DISHWASHER WHIRLPOOL WDT720PADM1 "Main wash pump not running, would need to replace sump assembly to repair. Quoted 85.90 labor to install. $216.89+tax for part. Customer will let us know if wants repaired." REFRIGERATOR WHIRLPOOL WRS321SDHV01 "Ms pic.The icemaker harvest arm is out of position and it will not advance in diagnostics. It has 123 volts to the icemaker. Needs icemaker wpw10300022 from truck stock. Replaced the icemaker and it taste good, filling to the correct depth.Adjusted the door height and the handles until,they are level to the customer’s satisfaction. Ch caked for leaks at the dispenser and found none after 8 glasses of 12ounces of water were dispensed.Tests good. Advised to allow 24 hours for it to start making ice. ; used 1 WPW10300022 (ICE MAKER) from stock"
MICROWAVE WHIRLPOOL WMH53521HZ3 "Tested cavity thermostat ok, found power back feeding through control board, only when P2 is connected, indicates short inside control. Ordering control to replace. Return 4/10 to install. ; ordrng 1 W11182110 (CONTROL)"
REFRIGERATOR MAYTAG MFI2570FEZ01 "Replaced the customer’s specter and approved dispenser door. Transferred the user Interface, dispenser paddles, the separator assembly, door handle and gasket, door stop, door bins, mullion heater, the dispenser chute gasket and the dispenser water line from the top of the door to the dispenser.The door looks great and the dispenser Nd icemaker functions test good." WASHER WHIRLPOOL WFW6620HW0 "Washer ..checked washer operation ,,washer ,no display on control panel ..no lights washer won't start ..checked and power to control board .light blinking in control board no power out to control panel ..bad control board ,ordering new control and control panel in case ,; ordrng 1 W11319991 (CONTROL ) and 1 W11322905 (PANEL )"
WASHER MAYTAG MVWB855DC3 "Washer ...checked out washer operation ..ran test cycle ,,and checked error codes f7-e9 error code locked rotor..on test cycle ,,all working good ,water filling good hot and cold ,,,Agatating good ,,and draining and spinning good ,,checked under wash basket ,all clear nothing stuck in tub and basket is turning good ,ran cycle and washer not advancing thru ,seems to stall out and restart ,,,control not advancing thru ,,control board is faulty not sensing right ,,ordering new control board ,; ordrng 1 W11171748 (CONTROL)"
WASHER WHIRLPOOL WTW4955HW1 "Washer ,,,,checked washer operation ,,ran washer and checked water filling ,water pipes banging when water cycles off and between hot and cold ,,checked water valve and normall operation of water valve ,will go between hot and cold shutting off really fast ,,all normall operation of water valve working normall ,instruct customer need to maybe get water suppressor on water supply lines to help with rattling of pipes ,"
OVEN WHIRLPOOL WFG525S0HS1 "Ms pic.takes too long torech the settemperature. Tech found aluminum foil covering the oven vents on the bottom. Removed the foil and performed a 6 cycle temperature test. The 3 high and3 low temperatures when the oven cycled off or on were355, 328, 358, 328, 361, 326 for a total of 2,056. 2,056/6= an average temperature of 343 degrees.Showed thecustomer how to calibrate the oven by holding the down arrow in for 5 seconds, then adjusting and pressing the stat. She calibrated it up 5 degrees." REFRIGERATOR WHIRLPOOL WRF757SDHZ00 "Ms pic.The filter was out when I arrived but it had been leaking from the filter when he had it in. Reinstalled the filter aNd took pictures of no leaks after 16 cups off. of water were dispensed with the filter suspended and the ceiling cover off. Took additional after another 12 ounces were dispensed with the ceiling cover installed with the filter in the correct position.If this happens again, advised the customer to tighten the filter to the right or rep,Ace it with a new one." MICROWAVE WHIRLPOOL WMH53521HZ3 "Replaced the electronic patrol,board and tested unit.the new board has 124 volts to it at the P1-1 connector. Using a sensitive non contact voltage detector, there is voltage going to the display board but it is dark.Needs the display board additionally.office to order parts and follow up,with the customer. ; ordrng 1 W11182110 (RP CONTROL BOARD) and 1 W11192682 (UI DISPLAY BOARD) and 1 XPART"
REFRIGERATOR WHIRLPOOL GS2SHEXNS00 Fou d main relay board bad. Board is NLA. Advised cust. WASHER WHIRLPOOL WFW6620HC0 "Washer .checked washer operation ..checked and control panel won't respond buttons not working ,ran test cycle error code f8-e1 ,,water valve problem ..checked water supply to washer good water ,,and checked pressure switch and hose ,,all good ...unplugged power cord ,and plugged back in to reset control ...control panel now working all buttons work ,.now rest cycle runs thru and working good ,reset control and all filling and running good ,"
DISHWASHER WHIRLPOOL WDTA50SAHZ0 "Installed fill hose ordered. Customer will install. Advised customer to check carefully for leaks on the left side on the first test cycle. Office to schedule with customer, a follow up visit to test unit." WASHER WHIRLPOOL WTW8500DW3 "Washer .checked washer operation ,,,ran washer cycle and checked for noise ..found washer noisey in agatation ,checked under washplate all clean washer transmission is starting to be noisey ,and bad ,needs transmission,part w10811956 ..part $254.71 shipping $12.00..total repair .$514.-$530 ..customer wants to think about repair ,declined for now ,; used 1 Ship (Shipping/Handling) from stock"
COOKTOP WHIRLPOOL WCG55US0HS00 Ms pic.Took pictures of residue covering the orifice and the burner. Cleaned the orifice with an orifice cleaner and cleaned the burner with a craft rush. All burners. Ow light on demand and test good. DISHWASHER KITCHEN AID KUDS30FXSS9 "Ms pic.In diagnostics, codes 4-3, 6-4 and 10-1 were displayed.code 4-3 indicates the motoris not running,.. that is correct.6-4 relates to too many suds at some time or a bad fuse on the board.10-1 indicates an electrical,issue with the dispenser or a bad fuse on the controll board.In the first test the motor was energized but not spraying water. In the second test it was not energized from the board. Tested again in the 1 hour wash cycle. The dispenser worked but the motor was not energized. Ch caked and found the F9 fuse on the board is open. Needs a new control board minimum and maybe. Anew motor sump assembly after the board, if it still doe nOt run .The estimate range to repair is $411 for a board and $647 for a board and motor sump assembly. Collected $97.95 today on card approval number 15301409883.The customer will call back if repairing." REFRIGERATOR WHIRLPOOL WRF767SDHZ00 "When receiving the robocall,the Customer pushed the button indicating the time frame scheduled did not work. He will call the office to reschedule.Ms still need verification. ; O-emld tckt"
WASHER WHIRLPOOL WFW85HEFW1 "Installed UI overlay and UI harness ordered. Unit started reacting the same as before.. turning on and off by itself. Using an extension cord from the van, plugged into another outlet not shared by the laundry room. Ran an auto test, drain spin cycle and a normal cycle. All were working normally. Plugged unit back into the laundry room outlet. Unit started to react as before. While assembling the washer. The dryer started to act the same as the washer. The dryer is on a separate 240 volt outlet. Advised customer to call contractor to have electrician change arc fault breakers and the outlet for both units"
REFRIGERATOR KITCHENAID KRFF707ESS01 "Found ff EVAP blocked with ice. Found lights flickering. Found unit cycling damper and 3 way valve. Cleared EVAP. Found thermistor cracked. Replaced thermistor. Pulled unit out on slider. Replaced main and led boards. Reassembled unit. Unit running and cooling normally. Lights working normally. ; used 1 W10830288 (LED BOARD), 1 W10838965 (THERMISTOR), and 1 W10843055 (BOARD) from stock"
REFRIGERATOR WHIRLPOOL WRF535SWHZ01 "Ms pic and of the doors both. Fore and after leveling them.Leveled the fresh food doors so,they are ven across." DRYER WHIRLPOOL WED4815EW1 "Dryer ,,,,ordered new dryer top .new part is damaged again ,,,,,customer at this point ,does not want to reorder another ,customer willing to leave dryer as is ,and does not want to order new top and do repair dryer is ok as is now ,"
WASHER MAYTAG MVWC565FW1 "At arrival attendant said its working now. Found an error code for suds detected. Cleared error code. Found different residents are using non he detergent on a normal cycle. Advised attendant on cycle selection, detergent use. All tested ok"
COOKTOP WHIRLPOOL WCG51US6DS00 Replaced the cooktop manifold. There was 1 bar on the gas leak detector in the room at the floor level before turning the gas on to the cooktop. Cooktop connections test good with no leaks.customer paid in full with $129.90 on check number 419.